Superconductivity is a phenomenon that occurs in the first 50 nm of the surface of a material. Radio frequency cavities are typically manufactured from bulk niobium, the only known superconductor that performs well at radio frequencies. Processing to obtain a good surface quality is essential. R&D work is currently focused on surface treatments, in particular the development of the electropolishing of niobium. It is also necessary to determine the location of any surface defects that could cause a cavity to transit from the superconducting state to the normal state due to local heating (quench) in order to identify the origin of the limitations. Attempts are currently being made to replace complex temperature measurements with a new method for detecting thermal waves in the superfluid helium. New superconductors must also be developed as the maximum magnetic field intensity that niobium can accommodate is approached. In RF applications, it appears that superconducting nanocomposites are the only materials that can accept a higher magnetic field than niobium. At the same time, design of new cavities allows production of the beams required for the recent projects which are very demanding in terms of performance. Examples include the new cavities for the Superconducting Proton Linac (SPL) and the European Spallation Source (SPL). 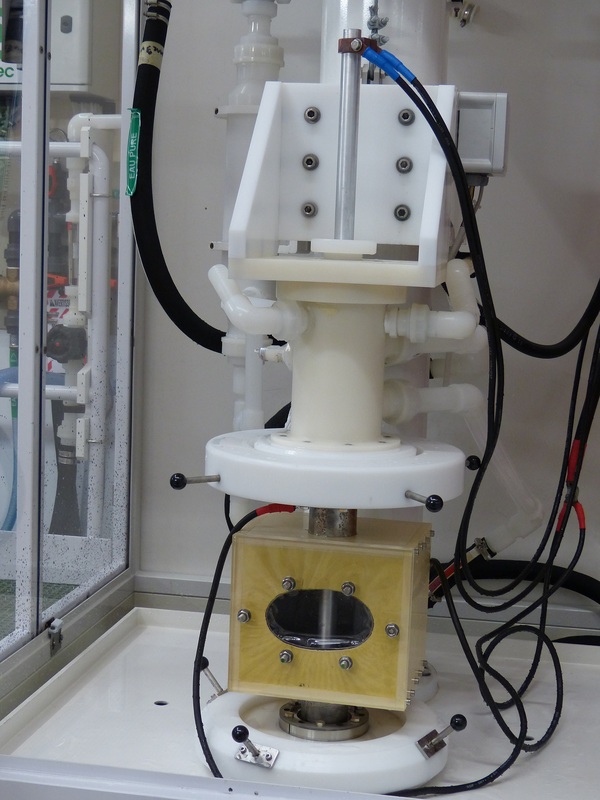 Research into the electrochemical polishing of superconducting niobium cavities has led to the development of an electropolishing setup where the elliptical cavity is placed vertically. The expected benefits of this type of setup include the simplification of the process, making it suitable for use with very large scale cavities, safety improvements, and future extensions of the application to the treatment of large scale resonators. The facility is based on the work carried out at Cornell University, but a number of significant advances have been proposed including improvements of the acid circulation, safety, and automated control, resulting in a reliable process suitable for transfer to industrial use. The process is appropriate for the treatment of the cavities developed for the International Linear Collider (ILC), and for the electropolishing of the cavities developed for the SPL. Modeling of the fluid dynamics during treatment of a cavity for the Superconducting Proton Linac (SPL). The project was carried out in the following three main phases; specifications, detailed design and drawings prepared by Auxitec Ingénierie, and construction by Corelec. The installation of this infrastructure was accompanied by a modeling study carried out using the Comsol Multiphysics software. This involved the simulation of the fluid dynamics and the distribution of the electrical field within the cavity, with the aim of predicting the behavior of the treatment as a function of the type of cavity used. This work revealed the effect of the dimensions of the cavity on the effectiveness of the process, requiring a specific cathode design for each configuration. The installation was commissioned and accepted at the end of 2011, and the regular treatment of R&D cavities (mono-cell and nine-cell operating at 1300 MHz) has confirmed the good performance of the facility throughout 2012. Twenty treatments have been carried out to date, with a total operating time of greater than 60 hours. The results of these treatments have confirmed the relevance of the preceding work on horizontal polishing with a low electrolysis potential. A low potential together with a high acid flow provides an effective answer to the constraints associated with this configuration, with a reduction in the temperature gradient along the cavity and the efficient evacuation of the gasses resulting from the electrochemical reactions. Initial radio frequency tests on single cell cavities in a vertical cryostat have achieved gradients of between 30 and 34 MV/m. Local heating due to the phenomenon of quench generates a second sound thermal wave in the superfluid helium. This second sound wave is detected by a set of oscillating superleak transducers (OST). The time delay between the arrival of the wave at the various transducers is used to calculate its velocity. This information is then used to calculate the distance of the quench site from each transducer. The position of the quench is then determined by triangulation. Work on this system began in 2010 with the delivery of eight OSTs and the development of a dedicated electronics board. These transducers were tested on several occasions in single cells in association with a quench location system using a temperature mapping arm. With the new system operational, the first location tests were carried out and the results compared with those produced by temperature mapping. It appeared that the apparent velocity of the thermal wave was not that expected for a second sound wave, differing by up to + 50%. 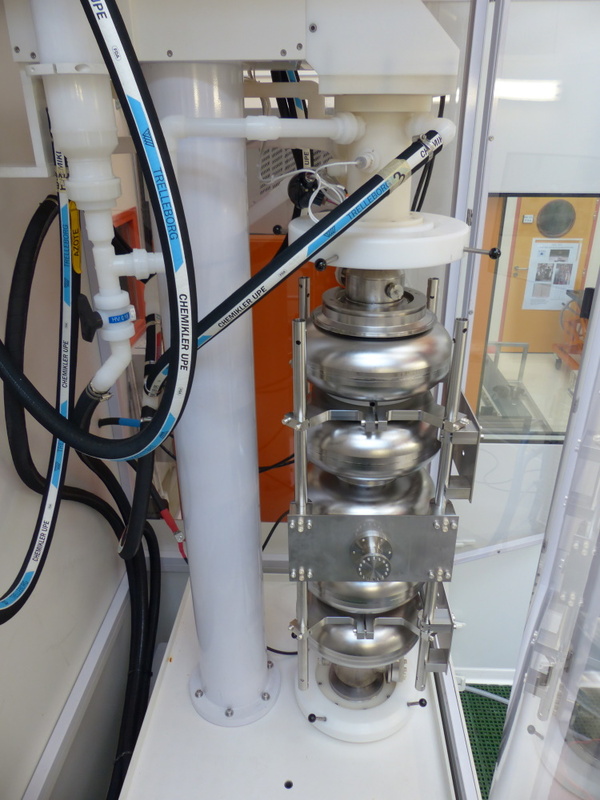 Further investigations were carried out with the aim of gaining a better understanding of the phenomena involved in the superfluid helium and improving the reliability of the technique. Lower critical field of various samples. The layer of pure niobium mimics the behavior of the solid niobium. One for four 25 nm layers of NbN have been tested. It is hoped that the results may be improved by increasing the number and thickness of the layers. Solid niobium cavities now appear to have reached their performance limit. It is thought that the local power dissipations at high field strengths that lead to quench are caused by the penetration of the lines of the magnetic field, a phenomenon known as vortex. In 2006, the theoretician A. Gurevich proposed a solution in which the surface of the cavity was shielded by a nanometric layer with a thickness less than the depth of penetration of the filed into the superconductor. This would attenuate the field as it passed through the layer, preventing the appearance of any vortex. By building up a sequence of several layers, the field within the niobium could be reduced while increasing the accelerating field in the cavity. Moreover, using a superconductor with a higher transition temperature would reduce the power dissipation in the surface. In collaboration with CEA INAC in Grenoble, SACM has succeeded in depositing NbN (25nm) / MgO (14nm) /… type composites on thick films of niobium deposited on a monocrystalline sapphire substrate. The cathodic pulverization techniques used were developed for the production of Josephson junctions, but a thick dielectric layer of MgO is needed to decouple the various superconducting layers from each other. Similar layers where also deposited on a bulk niobium flat disk suited for radio frequency measurements. In collaboration with the Italian Nuclear Physics Institute (INFM), SACM has made the first measurements of the vortex penetration field (the lower critical field HC1) using a local field measurement system that is free from the boundary effects normally found in traditional magnetometry. SACM then developed a local magnetometer capable of exploring a wide range of field strengths and temperatures, approaching those found in operating cavities. The results in terms of the critical field are very encouraging. At 6 K, the critical field has been increased by around 50 mT with less than 100 nm of NbN. Apparently an increase about 100 mT could be achieved between 2 and 4 K, corresponding to an accelerating field about 25 MV/m in a cavity, if layers of the same quality were obtained. Left: Niobium cover coated with four 25 nm layers of NbN. Right: The surface resistance of this sample at 3.88 GHz compared with a good cavity in solid niobium (scaled proportional to the square of the frequency). In collaboration with the Orsay Institute of Nuclear Physics (IPNO), SACM has also tested a sample of four 4 NbN layers deposited under similar conditions on the bulk niobium cavity cover. The surface resistance of these multi-layer structures can be measured using an accurate thermometric method. With four 25 nm layers, around half the shielding current circulates in the NbN and the remaining half in the niobium. It can be seen, as expected, that the layers dissipate less than the niobium in the high temperature regions under BCS conditions. At lower temperatures, the residual resistance is still quite high. However, no optimization has yet been carried out on this type of sample. These multilayer structures have a great potential for future superconducting radio frequency cavity technologies. Future R&D work is focused in two main directions; the optimization of the structures in terms of the number and thickness of the layers and the type of superconductor, and the development of deposition techniques suitable for application to cavities. Half-cells of a 704 MHz cavity with  = 1 during manufacture. The experience gained during the European High Intensity Pulsed Proton Injector (HIPPI) project in the design, technological development and testing of superconducting cavities, RF power couplers, and frequency tuning systems, has enabled SACM to become involved in the development of multi-cellular cavities for high energy protons in the SPL project and, more recently, the superconducting accelerator for the European Spallation Source (ESS).